IHG®, (InterContinental® Hotels Group), today announces that InterContinental® Hotels & Resorts, the world’s largest luxury hotel brand, has created a new global Culinary Calendar, designed to be a snapshot of five-star seasonal dishes for food and travel enthusiasts around the world. 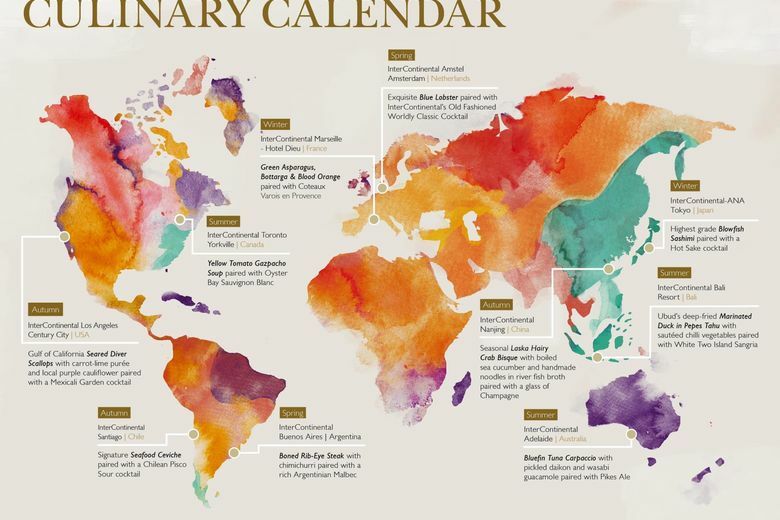 The new seasonal map showcases world-class dining experiences available to guests throughout the year, in every corner of the globe. From unique dining destinations to signature dishes created by an enviable roster of renowned chefs, the Culinary Calendar illustrates the brand’s unwavering commitment to offering the best seasonal and local cuisines; a practice which over seven decades, has seen InterContinental Hotels & Resorts establish itself as the ideal getaway for luxury leisure and business travellers with a discerning palate. Plating up 81 million meals annually, it takes a team of highly skilled and dedicated chefs to maintain InterContinental Hotels & Resorts’ luxury dining legacy. With several Michelin-starred restaurants across the portfolio and a team of internationally acclaimed chefs, including Gordon Ramsay, Theo Randall, Jason Atherton, Alain Ducasse, and Martha Ortiz, who is soon to join the team, the brand remains at the forefront of luxury travel and dining. Featured in the new Culinary Calendar and leading the growing food trend to offer versatile and innovative seafood-inspired menus, InterContinental Santiago’s signature Seafood Ceviche served in Autumn, perfectly demonstrates the ‘ocean-to-plate concept’ with its octopus, shrimp and squid, caught and served on the same day. Adding to the culturally authentic dining experience, the ceviche is paired with a traditional Pisco Sour cocktail, a recipe that originated in the region. Across the Pacific Ocean to Japan, the Winter menu at InterContinental-ANA Tokyo offers guests Tokyo’s highest grade Blowfish Sashimi, one of the country’s most exclusive seafood delicacies sourced from the famed Tsukiji Market. For lovers of lobster, InterContinental Amstel Amsterdam is the place to visit in Spring, with the famous and locally sourced, Blue Lobster served alongside InterContinental’s classic Old Fashioned Worldly Classic Cocktail. Also featured in the Culinary Calendar is InterContinental Bali Resort, located in one of the world’s most desirable travel destinations. The hotel’s renowned Summer signature dish,Marinated Duck in Pepes Tahuserved with sautéed chilli vegetables, is the resort’s most sought-after menu item and is perfectly complemented by aWhite Two Island Sangria, made with Balinese white wine and local tropical fruits. For guests travelling to North-America, InterContinental Los Angeles Century City offers mouth-wateringSeared Diver Scallops with carrot-lime purée and local purple cauliflower during the Autumn months. Using succulent scallops caught in the nearby Gulf of California, the speciality dish is full of vibrant colours and textures to reflect the changing colours of the season and is complemented by a Mexicali Garden cocktail, flavoured with herbs and fruit grown in California. With a seven-decade heritage in restaurant and bar excellence, InterContinental Hotels & Resorts has catered for some of the world’s most illustrious people, from Princess Grace Kelly, Audrey Hepburn and Martin Luther King, to The Rolling Stones, Elton John and Queen Elizabeth II. Embarking on a new era in luxury travel, the brand continues to grow and evolve its culinary expertise to offer guests the very best five-star local cuisine in every corner of the globe.